Restoring the hearts of the fathers to the children. 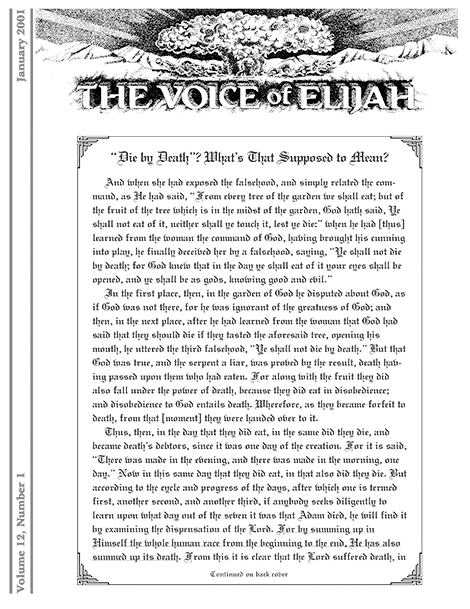 This article contains an explanation of the parabolic imagery that stands behind the nuclear cloud in The Voice of Elijah® masthead. Along the way, it explains the parabolic equivalencies that appear in the “riddle in a mirror.” It also includes diagrams that show how those images equate to the events the Prophets call ‘olam—that is, “the burning.” It concludes by explaining all of these parabolic equivalencies are pointing to just one event—the Second Coming of Jesus Christ at the End of the Age. The purpose of this column is to explain various weather-related parabolic images that relate to the Last Days and the Second Coming of Jesus Christ. This edition suggests that a politician cannot be expected to leave his religious beliefs at home. This set of “Questions & Answers” begins with an explanation of the parabolic pantomime that Jesus conducted when the adulteress woman was brought to Him (John 8:1–11). The answer includes a survey of how and why that passage came to be included in John’s Gospel. A second answer explains how Moses used the Hebrew phrase translated “these are the generations of” to divide the Book of Genesis into logical segments. 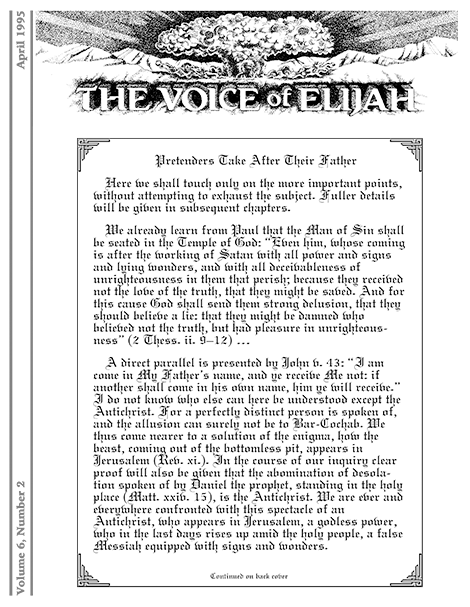 A final answer plainly spells out the significance of The Voice of Elijah® logo. For forty years, the angry fire of God’s wrath danced upon the Earth in parabolic pantomime as the “angel” Who inhabited that billowing “pillar of cloud” showed the sons of Israel “The Way” they were to “walk.” The astounding presence of that fiery mushroom cloud towered over them as their constant companion from the time Israel, the Firstborn Son of God, parabolically entered the realm of the dead and passed through the Sea of Reeds until He arose from the dead in the parabolic pantomime in which Israel, the resurrected Firstborn Son of God, “went up” from the Jordan River to inherit the Promised Land (see The Passover Parable). Yet what are we to make of all that parabolic imagery? How does it relate to the situation we face today—a situation in which we can only watch and wait until that cunningly deceptive little man finally rebuilds the Temple in Jerusalem and ushers in the destruction of the man Adam. 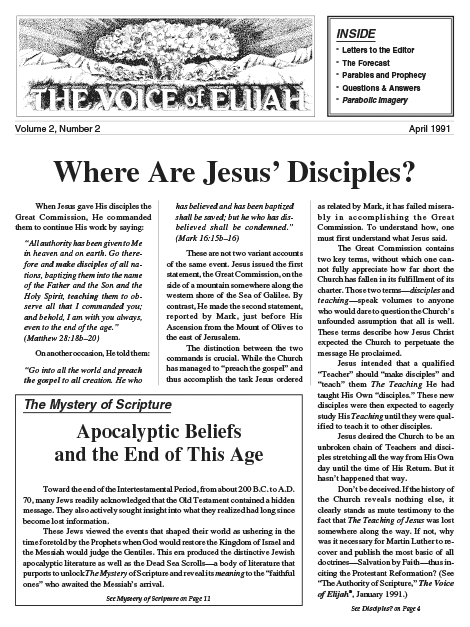 (See “That’s Why He’s Called AntiChrist!” The Voice of Elijah®, April 1992; The AntiChrist; and The Advent of Christ and AntiChrist.) The answer to that question may surprise you. To understand the message of the Scriptures, one needs to know that God orchestrated the entire life of the Man Jesus Christ as a parabolic pantomime—a parabolic depiction—of the biblical history of the man Israel. 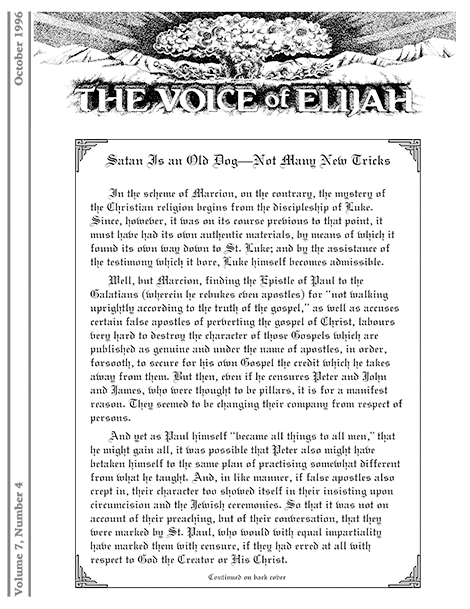 (See “They Got God at a Fire Sale Price (and a Whole Lot More Than They Bargained For)—Part II,” The Voice of Elijah®, July 1999; “There Is Nothing More Amazing Than Dead Men Walking (in ‘The Way’),” The Voice of Elijah®, January 2000; “Questions & Answers,” The Voice of Elijah®, July 2000; “Questions & Answers,” The Voice of Elijah®, October 2000.) That is, embedded in Matthew’s record of the life of Christ is a parabolic chronicle of events which Moses and the other Prophets of Israel tell us befell (or would befall) Jacob and his descendants. However, God had long since made sure that the biblical history of the man Israel was also a parabolic pantomime. In it, He chronicles the entire history of the man Adam. So the biblical account of what Jesus said and did parabolically depicts the history of Adam and all his descendants from the day of Adam’s creation to the time when the fire of God’s wrath finally removes the descendants of Adam from the face of the Earth (Zeph.1:2–3). Jesus told His disciples to “make disciples of all nations” by teaching them what He had taught them (Matt. 28:19–20). He also told them “to preach the gospel to all creation” (Mark 16:15). While the Church has managed to “preach the gospel” in most of the nations of the world, it has failed miserably to “make disciples” for Christ. This article explains the distinction between preaching and teaching, and why the Church has not made true disciples for Jesus Christ. In this article, an excerpt from a work titled The Imitation of Christ is followed by comments concerning what it really means to have Jesus Christ “in your heart.” That cliché is commonplace today, but it means a whole lot more than Pretenders could ever imagine. This article contains a penetrating examination of the origin and distribution of the single most important lie that Satan has ever foisted off on the Church—Dispensationalism. It explains why he is feverishly promoting the Big Lie in these Last Days, and includes a timeline depicting events leading up to the Second Coming. Browse through our library of booklets and newsletters—absolutely free! Copyright © 1998–2019 Voice of Elijah, Inc. All Rights Reserved.